Capcom's Blue Bomber is back! We jump into his arm cannon and explore Bounce Man's level. Mega Man is a tough game, but it will be slightly less tough with these tips. We Promise. Check out his inflated sense of self-worth. Take the blue bomber for a short spin. The construction-themed boss aims to put a hole in the blue bomber’s plans in the newest video from the upcoming game. No Elmer Fudd voices here! Another fire boss comes to the series. Capcom also details Balloon Attack, Time Attack, and its upgrade system. Official pictures of the Limited Edition show art of the doctors when they were younger. 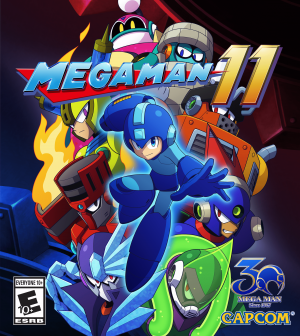 There's also "no announcement" regarding the European release of the amiibo included in the Mega Man 11 amiibo Edition.